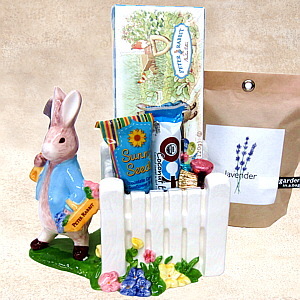 Peter Rabbits stands defiantly with shovel in hand ready to dig into this ceramic container full of treats. We did include a Lavender Garden in a bag Plant (seeds and materials to grow it in) that will be perfectly housed within the picket fence. Since it is Easter we had to include Jelly Beans in a decorative Peter Rabbit box. We keep seeds coming, but these you can eat: Sunny Seeds Chocolate Covered Sunflower Seeds. We also have an Ocho Organic Coconut Chocolate Candy Bar and a few other Easter treats sprinkled in. Hop to it and send spring greetings to someone today.